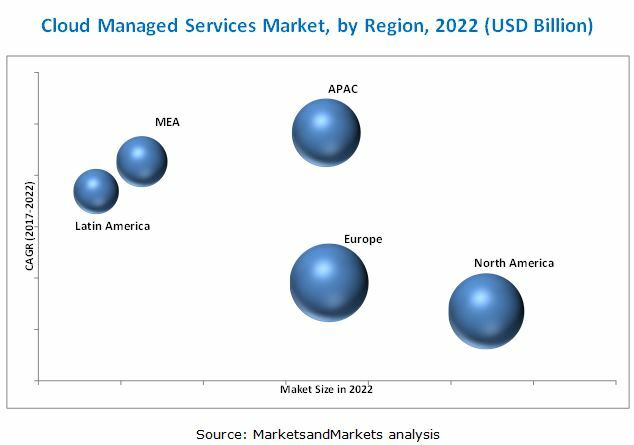 [147 pages report] The cloud managed services market size is projected to grow from USD 27.15 billion in 2017 to USD 53.78 billion by 2022, at an expected CAGR of 14.6%. As the business requirements are dynamic, customers are looking for new solutions and services that can be implemented in today’s continuous changing technology. As solutions are increasing in different markets, the requirement for services has equally become important. It can be anticipated that gen-next integrated ICT services that include a vast range of professional and integrated services, is expected to grow to meet the increasing demand from businesses operating in analytics, big data, IoT and infrastructure management. Now, with the upcoming technologies available for analyzing resources stored in the cloud, companies are taking advantage of the increased scalability and lower overhead, directing the shift from physical machines to cloud-based big data solutions. Moreover, the rising global trends in big data and analytics have distinctly become visible. As per an article by IBM, 2.5 quintillion (2.5×1018) bytes of data are being created every day. This has led organizations across various regions to change their strategies to adapt their business environments to the ongoing global trends in big data and cloud analytics. These factors are considered to be some of the most crucial driving forces for the growth of managed services worldwide. The ICT investments in the regions such as APAC and MEA are expected to register extensive growth, wherein the demand for public and private cloud services are also likely to increase, driven by the presence of large enterprises in the telecom, retail, and manufacturing industries. 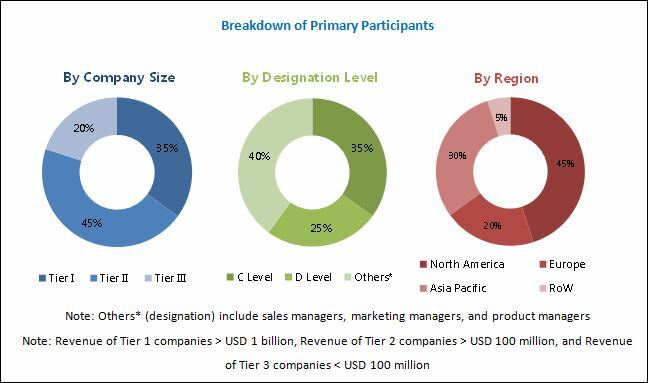 The main objective of this report is to define, describe, and forecast the cloud managed services market on the basis of segments which include component, deployment type, organization size, vertical, and region. The report provides detailed information regarding the major factors influencing the growth of the market (drivers, restraints, opportunities, and industry-specific challenges). The report forecasts the market size with respect to five main regions, namely, North America, Europe, Asia Pacific (APAC), Middle East and Africa (MEA), and Latin America. The report strategically profiles key players and comprehensively analyzes their core competencies. This report also tracks and analyzes competitive developments such as mergers and acquisitions, new product developments, and Research and Development (R&D) activities in the cloud managed services market. In March 2017, Cisco acquired AppDynamics, a leader in application and business monitoring. This is expected to help Cisco and AppDynamics deliver visibility across the network and drive digital transformation to enhance customer experience. In March 2017, Huawei launched a cloud-based high performance unified CDN solution that enables flexible distribution and an enhanced scheduling capability. It supports fixed and mobile networks, such as IPTV, OTT content, online streaming video, internet cache, and B2B CDN. In February 2017, Ericsson partnered with Verizon, a CSP, to meet the customer demands. Through this partnership, Ericsson offered its software and services to Verizon. Ericsson also managed to strengthen its business portfolio of virtual network services globally, as it is widely adopted by the CSPs. In February 2017, NTT DATA collaborated with Oracle to bring healthcare Big Data to the Cloud. This collaboration would help both the companies in predictive modeling of resources. In April 2016, IBM formed a partnership with Idea Cellular, a telecom service provider in India, to provide improved customer service. Through the partnership, IBM is likely to work on enhancing the customer service of Idea Cellular by providing improved billing and payment systems. Moreover, the partnership would help IBM to keep pace with the competitors, in terms of business growth and expansion. The cloud-managed service ecosystem comprises vendors such as IBM technologies(US), Huawei Technologies (China), Alcatel-Lucent (Finland), NTT DATA Corporation (Japan), and Cisco Systems (US); service providers, system integrators, and enterprises. Other stakeholders of the cloud managed services market include cyber security vendors, distributors, IT security agencies, OEM, consulting service providers, IT service providers, resellers, telecom operators, enterprise users, and technology providers. The cloud managed services market is expected to grow from USD 27.15 billion in 2017 to USD 53.78 billion by 2022, at a Compound Annual Growth Rate (CAGR) of 14.6%. Increasing ICT spending and growing trend of big data analytics, increasing adoption of managed services by SMEs, and need for companies to focus on their core business are the major drivers of this market. Mobility services and security services are the fastest growing managed service in the market. The proliferation of mobile devices and trend of BYOD in various organizations has made companies to seek for services that could help them to manage these devices along with the data generated through it, for better utilization and security need. Moreover, IoT adoption and big data trend has led to sudden requirement of data security due to which, managed security services is witnessing high demand among customers. Moreover, these requirements have led SMEs to opt and demand for managed services and focus on their core business to incur better results. Private cloud-based deployments is gaining high traction in the market as it provides better control of the data and can reduce the risk of loss of data and issues connected to the regulatory compliance. Moreover, due its seamless benefits such as organization control, cost and energy efficiency, and improved reliability, companies prefer to deploy private cloud in their environment. Large enterprises had the highest market size, whereas, SMEs are expected to gain high traction of cloud managed service during the forecast period of 2017-2022. Unlike large enterprises, SMEs have resource crunch and need to manage their processes with limited budget. Managed services help them to outsource their less important activities and focus on their core business requirements. Furthermore, security and compliance, reduction in downtime are some of the major benefits small enterprises are experiencing through the adoption of managed services. Asia Pacific (APAC) is expected to grow at the highest CAGR from 2017 to 2022 in the cloud managed services market. With the companies rapidly outsourcing IT related functions in the APAC region, cloud and managed service model has become of utmost importance to them for better productivity and cost-effectiveness. This has increased the demand for managed services. Moreover, North America being the most advanced region in cloud technology has higher adoption of managed services due to the increased organizational and communication activities. Managed infrastructure services help in maintaining service quality, consistency, and stability in the IT operations of an organization. The success of any organization is heavily dependent on exceptional end-user and communication services. Managed infrastructure services allow organizations to transfer their day-to-day activities to a third party called MSPs, as a strategic method to improve effectiveness and efficiency of their infrastructure. These providers design custom service solutions to meet the personnel, process, and technology needs that allow an organization to achieve its business goals and maintain infrastructure stability. The managed infrastructure services segment consists of various services such as data center services, end-user services, and technical and communication services. It is expected that MSPs would target the international organizations for end-user services in the future. Infrastructure services are thriving around the globe and occupy a major market among other managed services. Managed network services enable the enterprises to outsource their network infrastructure and IP-based communication. These services include managed network security, unified communications, managed routers, managed Local/Wide Area Network (LAN/WAN), managed Wi-Fi, and other monitoring services. MSPs also provide security firewalls and value-added services as complimentary features or charged separately. The entire network infrastructure system is completely monitored and maintained by the service providers. The introduction of 3G and 4G LTE services has paved the way for increased deployment of networking and other communication infrastructure. The demand for 3G and 4G broadband has increased multiple folds with the growing trend for smartphones and other mobility devices. It can be concluded that the progressing network infrastructures and rising adoption of mobility and BYOD technologies across organizations in the region would allow better adoption of managed network services. Information, data, and the technology used to access, utilize, store, and transfer it have become the primary drivers of value creation in the global digital landscape. Businesses, in every industry, deal with massive amount of data on a daily basis that must be protected from unauthorized access, destruction, and theft. Similarly, the complex computer systems/networks through which this information is processed must be safeguarded. Failure to protect these valuable information assets can result in negative consequences, including major financial losses and legal liability. Designing, implementing, and managing a successful security program is a vast, complex, and costly undertaking for most companies. Rather than assuming all of the risks/liabilities themselves, many companies share the risks with managed security service providers by outsourcing services such as Security Information and Event Management (SIEM), Intrusion Detection System/Intrusion Prevention System (IDS/IPS), log management, and other network monitoring services. The deployment of these services will gain immense traction with reduced infrastructure costs in the near future. Managed data center services increase efficiency and business productivity by creating improvised ways to deliver data center resources. These services guarantee increased business continuity and enhanced security of data to cater to the current and future business demands. MSPs offer comprehensive hosting capabilities and provide secure hosting of web or other application servers, and related internet connectivity. Managed data center services ensure better computing performance by optimum utilization of storage elements, network resources, virtualization software, and infrastructure management solutions within the data center. Thus, managed data center services help organizations reduce the cost involved in cooling requirements and power consumptions, as well as simplify the management of resources and data. These services include managed servers, hosting, managed storage, disaster recovery services, and monitoring and analytics services. Managed mobility services involve procuring, deploying, and managing mobile devices, applications, software, and services connecting mobile workers to the enterprise environment. These services help in easing the burden of enterprises’ IT departments by managing the complexities of multiple device platforms. Nowadays, the trend of utilizing smartphones, tablets, and other mobile devices is increasing; hence, the prospects of managed mobility solutions have increased across diverse industry verticals for enhanced productivity, data security, and privacy. Managed mobility services provide enterprises with the support of a wide variety of devices and wireless points, enable employees to share and interact easily when away or on move, maintain security, manage multivendor environment, and enable enterprises to focus on their core competencies. With cloud messaging, end-users can swiftly and confidently mobilize their businesses with minimal complications, set-up times, and at minimum infrastructure expenses. Where will the developments in cloud managed services market ecosystem take the industry in the mid to long term? What are the upcoming opportunities for cloud managed service providers? Concerns for privacy and security and inefficiency of cloud model facing issues of connectivity and high bandwidth cost are some of the restraints of the market. The pace with which companies are embracing IT technology, solutions, and platform, it is important for the companies to opt for better privacy and security services and thus companies are relying on managed service. However, companies feel the deployment of cloud managed services would result in the loss of control over their infrastructure. Thus, this factor remains a constraint for organizations before deploying these services. However, due to the increasing cloud adoption, many companies are able to provide huge number of managed service with ease to cater to the customer requirements. The major vendors in the cloud managed services market include IBM Corporation (US), Cisco Systems (US), Ericsson (Sweden), Accenture PLC (Republic of Ireland), NTT Data Corporation (Japan), Fujitsu Ltd. (Japan), Huawei Technologies(China), and NEC Corporation(Japan). These players adopted various strategies such as new product development, mergers and acquisitions, collaboration, and partnerships to serve the cloud managed services market. With the help of cloud and big data technologies, the current dominant market players in cloud managed services are able to innovate a number of services to cater to demands of the customers. Improving economy and internet use across all the regions is giving chance to these companies to serve customers with better services. *Details on Overview, Company Scorecard, Product Offerings, Business Strategies, and Recent Developments Might Not Be Captured in Case of Unlisted Companies.